Contrary to local legend, this building apparently was never part of the New Albany & Salem Railroad. 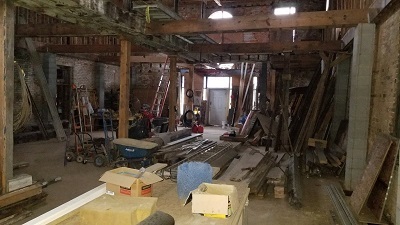 Although one of the partners in the manufacturing company, James Brooks, was the founder and president of the NA & S RR, this building was constructed prior to the founding of the railroad. The New Albany Patent Bagging Manufacturing Co. purchased the lot in May 1844 from William Drysdale, the developer of this plat. By the time of the printing of the 1845 New Albany City Directory, the above company was listed as being located here and gives the names of the partners. Besides Mr. Brooks, dealer in china, glass and queensware, the other gentlemen were Mason Fitch, president of the local branch of the State Bank of Indiana, and a Mr. Cutler. The company was short lived and in March 1848, Benjamin Adams purchased the building and owned it until April of 1860. Between the years 1848 through the mid 1858, no record can be found of who occupied the building. 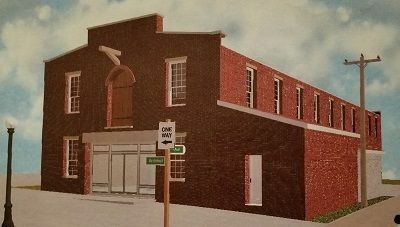 The NA & S RR may have used the building during this time, given its proximity to the railroad property across Pearl Street. 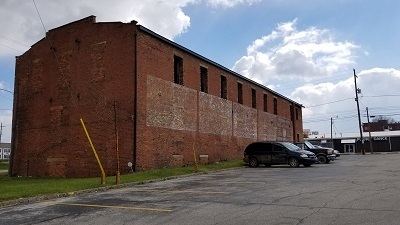 By the time the 1859 New Albany City Directory was published, John C. Brown had his planing mill and door, blind and sash factory located here. In 1868, the company name was changed to Howard & Co. and Isaac B. Friend was a partner in this enterprise. In February 1869, Mr. Friend purchased the property for $8,000, and by the time the 1871 City Directory was published the building was home to I. B. Friend’s New Albany Planing Mill, manufacturer of sash, door and blinds. Isaac was also a New Albany contractor and builder, and was responsible for many of the fine residences and commercial buildings throughout the city. The New Albany Planing Mill remained in this building until around 1902. 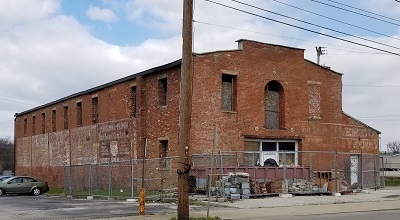 In 1903, the New Albany Table Company, Inc. was occupying the facility. W. A. McLean was the president while Ferdinand T. Kahler was the secretary and treasurer. This was the forerunner of the F. Kahler & Son Company which was established a short time later in the building. The new company manufactured table tops and interior work. In 1909, the Kahler Co. was awarded an extensive contract for automobile beds from a company in the east. Kahler remained at this location until his new plant was completed at the North Y around 1910. The building remained vacant for several years before being home to the International Harvester Co. of America. By 1925, and for almost 10 years, Zier Lumber & Manufacturers was located here. In 1939, the Harrison-Floyd County Farm Bureau Coop. Association was occupying the structure and remained for almost 50 years serving the Floyd County farming community. 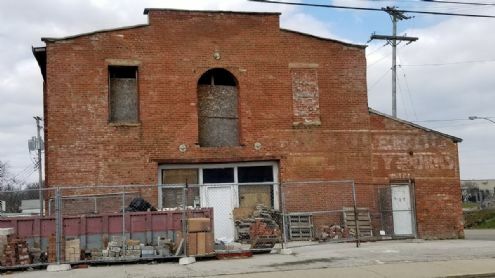 The current owner purchased the property about a decade ago following a partial collapse, and has completed extensive structural and masonry repairs on the building. Here's your chance to get over 10,000sf of building 2 story plus a basement. Could be a lot of things to include a nice multi-family project which is the next great growth to the expanding and growing downtown. Walk to the grocery, walk a block and enjoy all of Downtown New Albany's restaurants, retail, farmers market, community theater, government services, post office, legal and financial services, the Bicentennial Park, local ball park, various performing arts events, the YMCA, the riverfront and much more. The owner bought this property years ago and has taken what was a questionable property and has now completed a tremendous amount of work that will help kick-start the next owner into a more rapid finish. 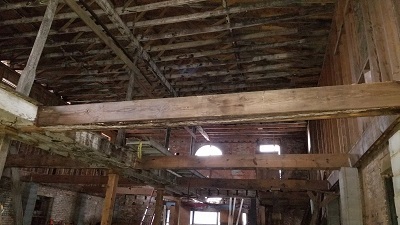 New roof (shingles, sheeting and underlayment) in 2017 with more than half of all trusses being replaced as needed, demo was done, partial floor reworked and completed, piers added for floor support, 90% of tuck-pointing completed, lots of great timbers still in place and much more was done by the owner who is passionate about restoration as that is his business.